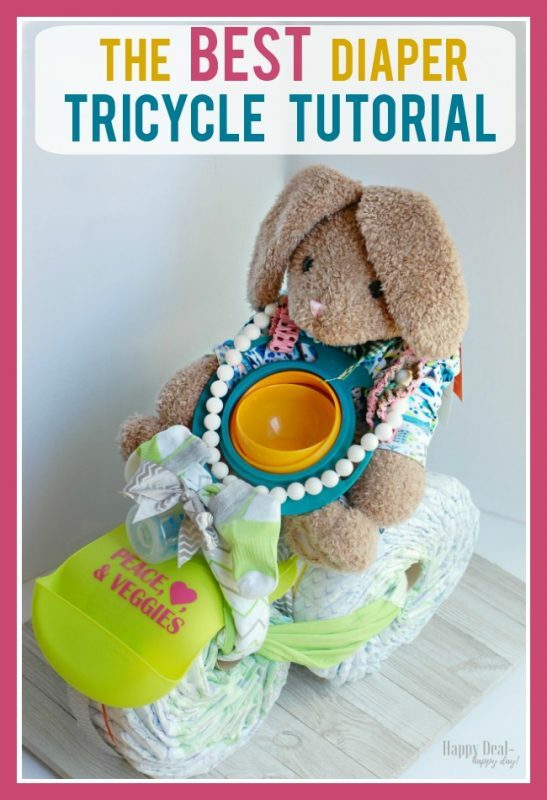 DIY Diaper Tricycle Tutorial for a Baby Shower Gift - The Best Step By Step Guide To Make Your Own! | Happy Deal - Happy Day! 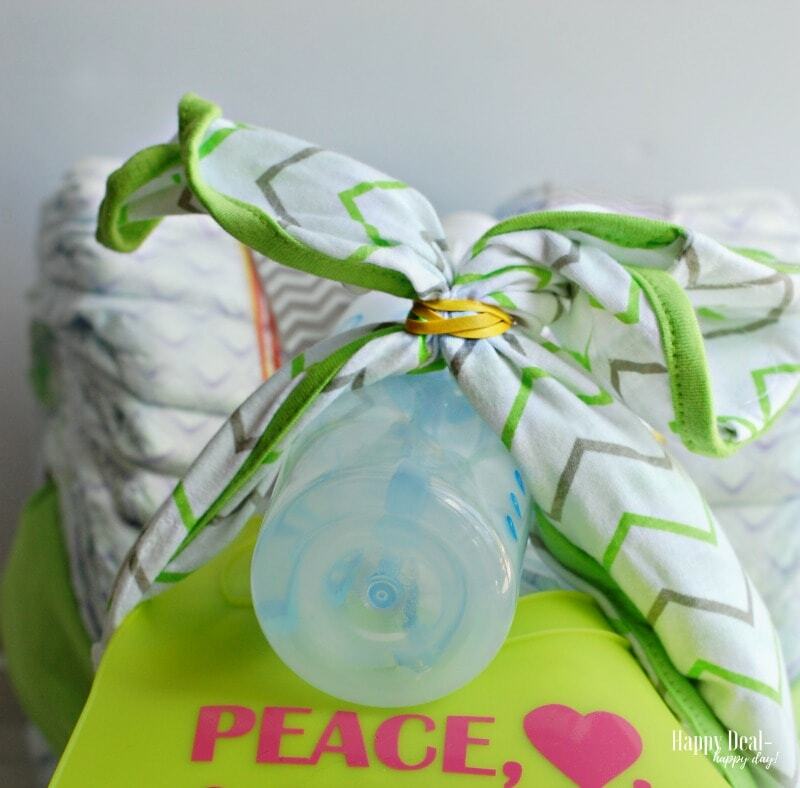 DIY Diaper Tricycle Tutorial for a Baby Shower Gift – The Best Step By Step Guide To Make Your Own! 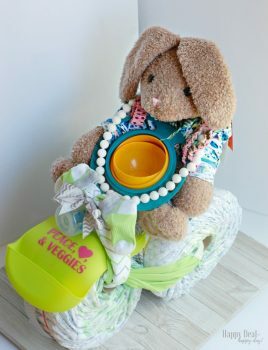 I remember the first time I saw a diaper bike on Pinterest, I thought the idea was so stinkin’ cute that I just had to make one for my future niece or nephew who is due August 2018! I decided to make a tricycle though because it would be more stable. 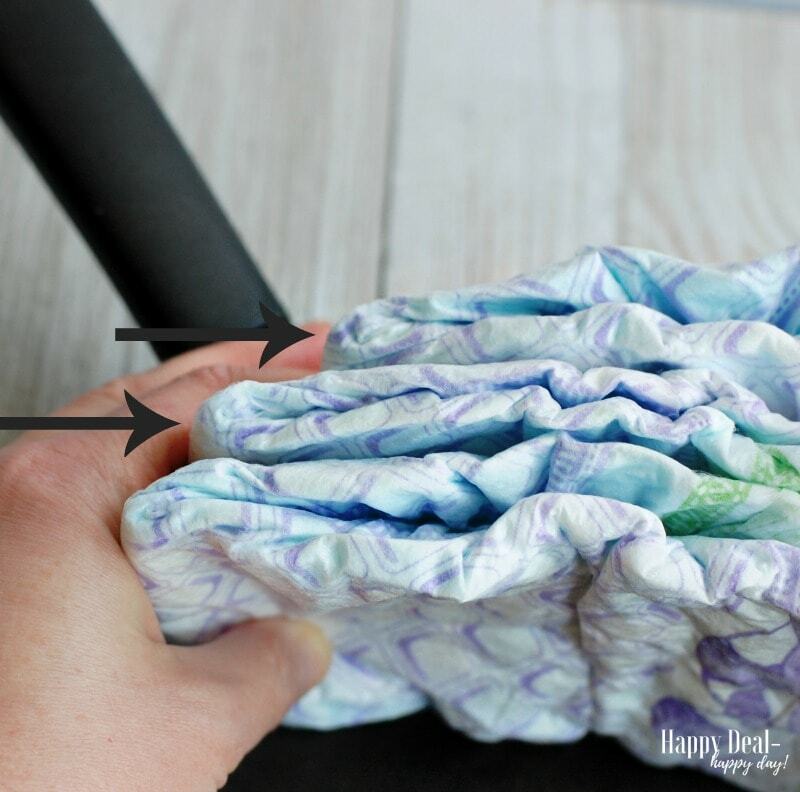 I couldn’t easily find a post with up close step by step pictures showing exactly how to make a diaper tricycle and what products were used to add to it – so I decided to make the best tutorial I could to make it super easy for you to duplicate! 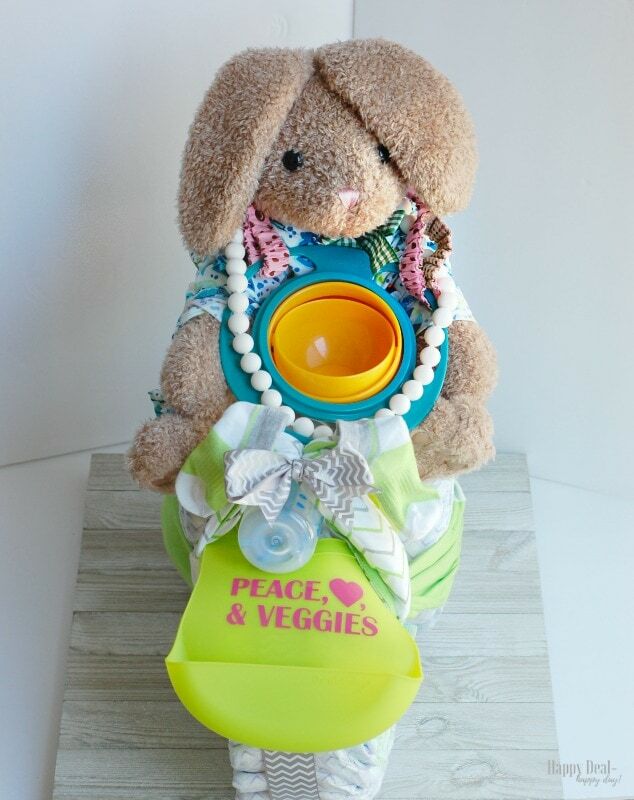 Then you can bring a similar show stopper gift to the next baby shower you are invited to! ribbon – I used an entire 9 ft. roll in the entire tricycle. 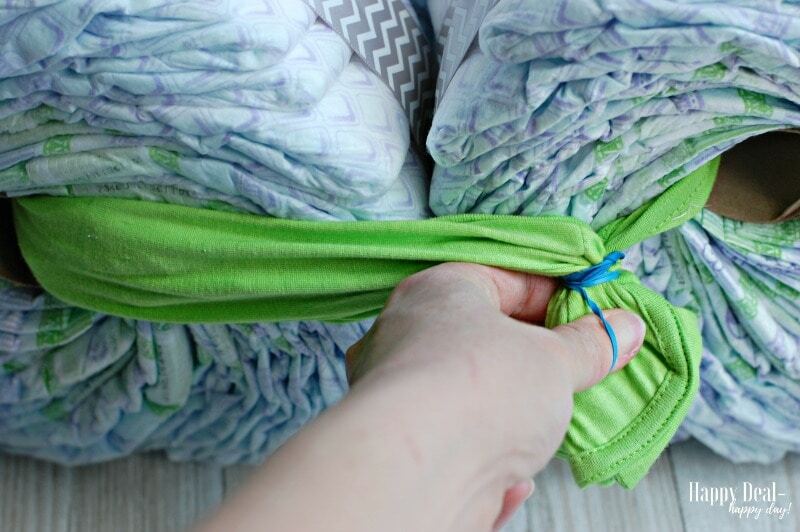 Grab a few diapers and line them up so that they are about an inch apart from each other. See how I lined them up in the picture above with the arrows showing the distance between each diaper. 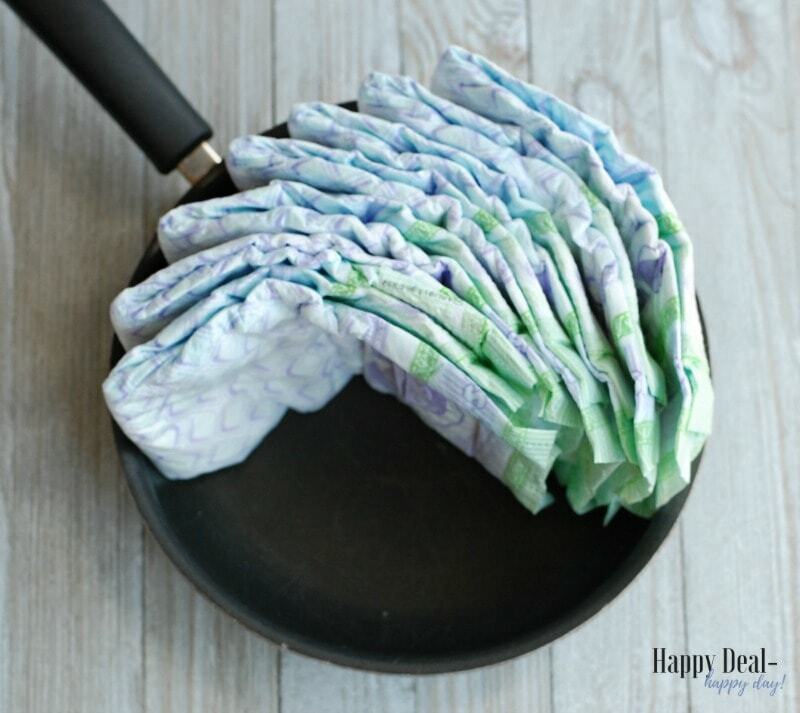 Place them in a 9″ frying pan and continue adding diapers in this fashion, one at a time. 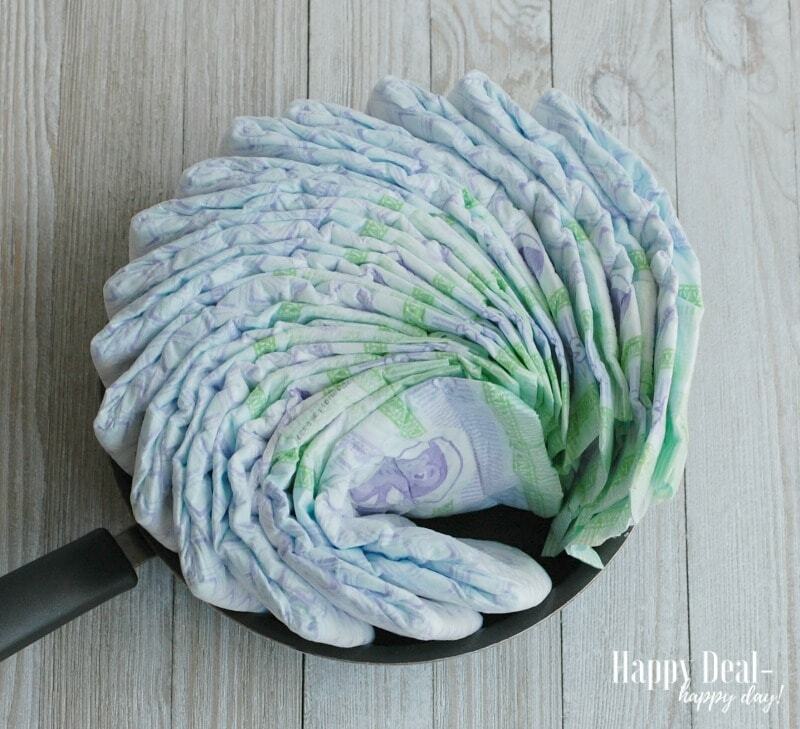 Your frying pan filled with diapers will get so full that you’ll think you can’t fit anymore. But keep going! 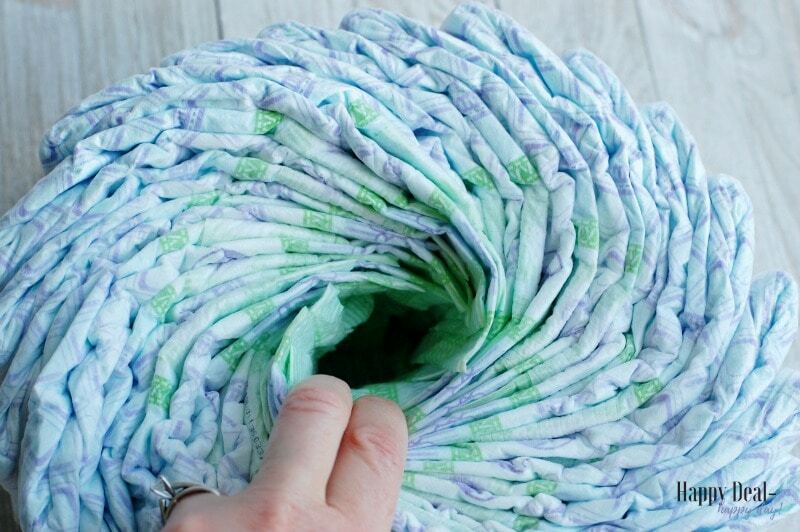 You need to keep filling until you have about 25 diapers making a complete circle. 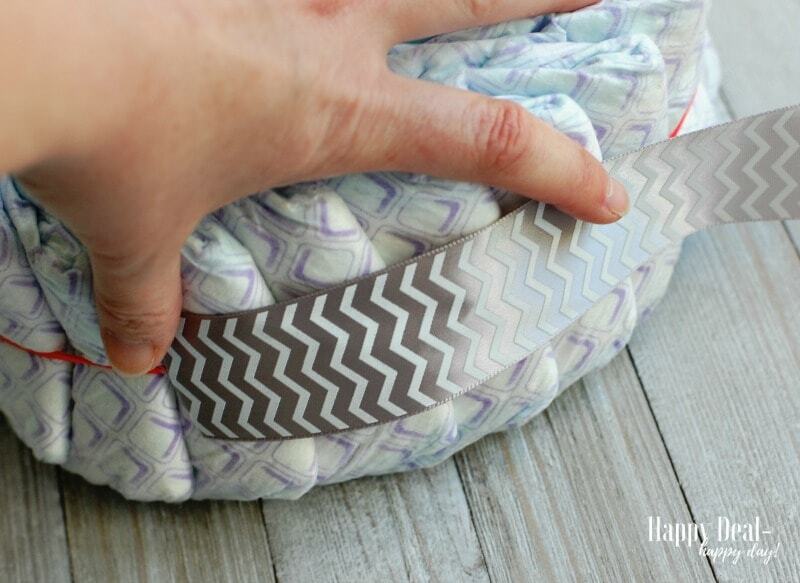 Just keep tucking in the thin part of the diaper into the center. 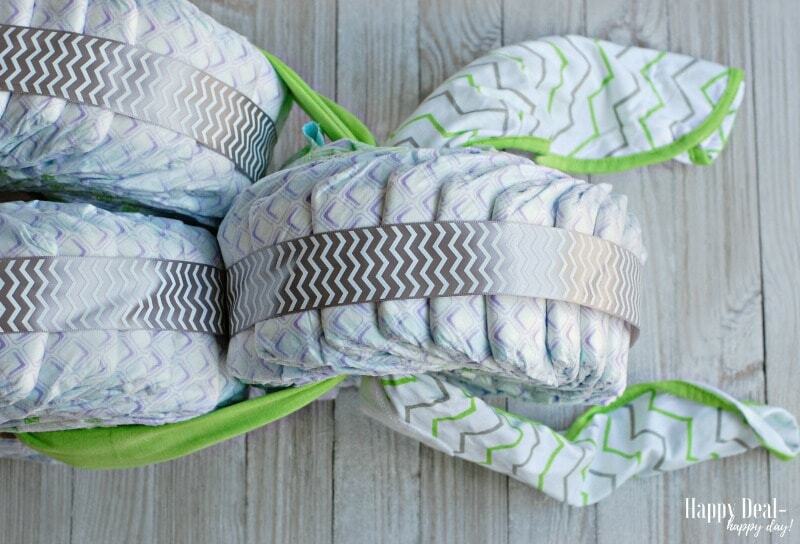 You will want your rubber bands close by because these will keep your diapers in a circle. Once your circle is complete, grab a rubber band or 2, in the center, to hold it together. 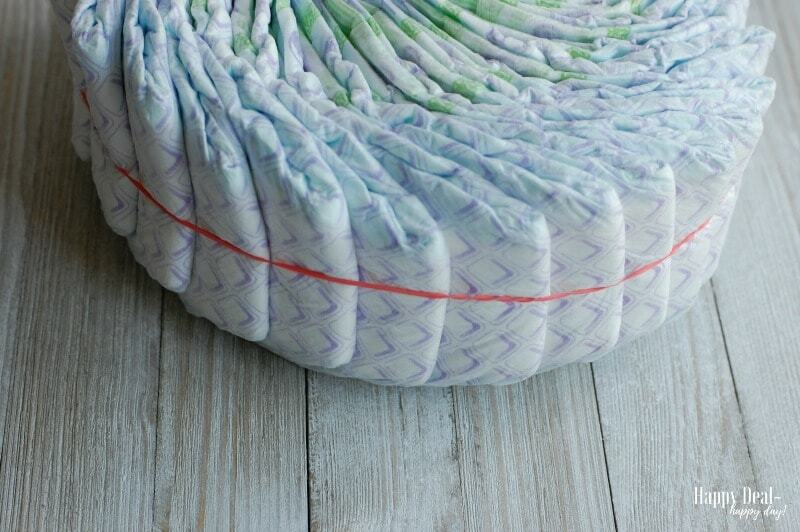 Then you will want to find the very center of the diapers and stretch it a bit so you can fit a toilet paper roll in it. This will make the wheel more stable and less likely to squish with the cardboard roll at the center. Now you need to go back and do these steps two more times so that you have 3 wheels total. Now that you have all three wheels completed, its time to put the whole diaper tricycle together and add some accessories. Many of the accessories I added to my diaper tricycle came from my list of Baby Products New Moms will Actually Use. 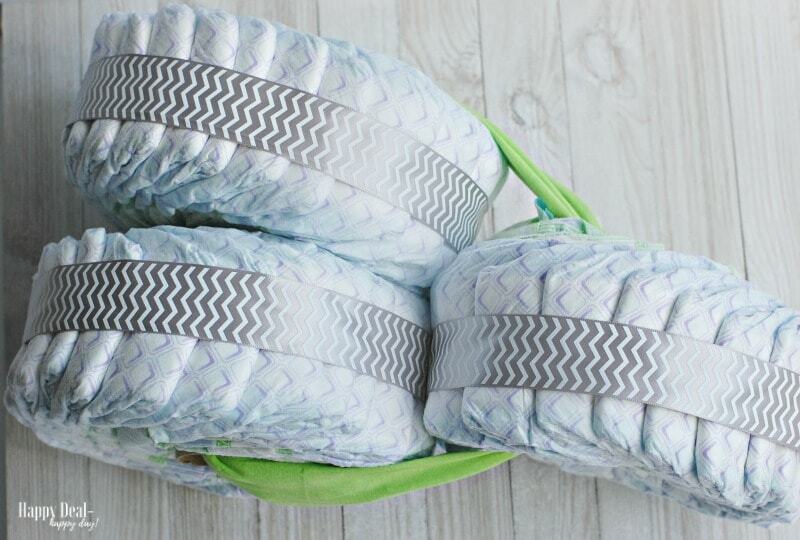 To keep the wheels together, you will use a rolled up received blanket or swaddle blanket to secure it all together. 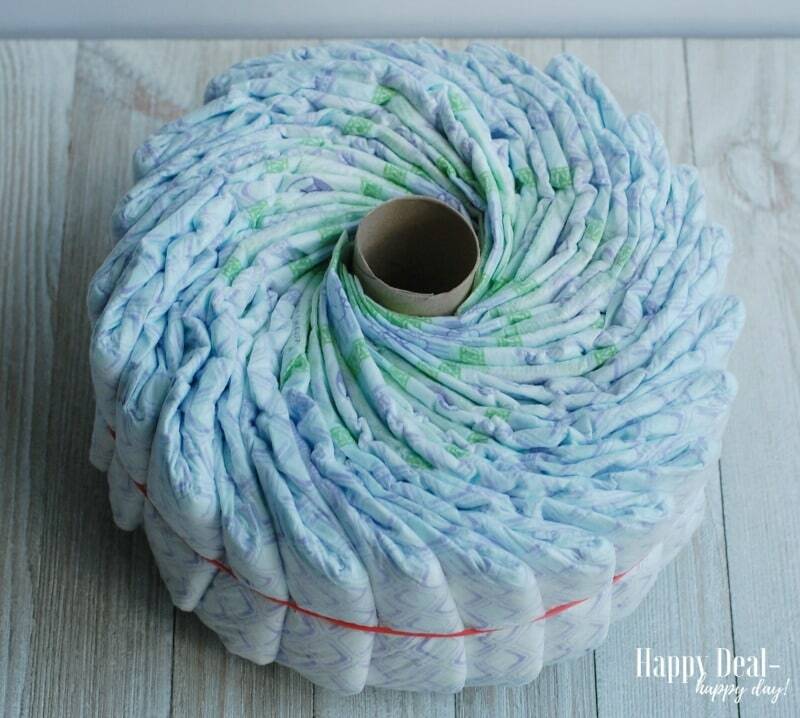 Thread the rolled blanket into each of the toilet paper rolls and secure the end with a rubber band. Tuck the rubber band back into the center of the toilet paper roll so it is hidden. Now all three wheels are connected to each other. Now it’s time to construct the front of the bike and make some bike handles. Again, you will need a second received blanket, or in my case a ziggy baby swaddle blanket and roll it up. Thread the second blanket through the toilet paper roll of the front wheel. Now grab a bottle and place that on top of the front wheel. 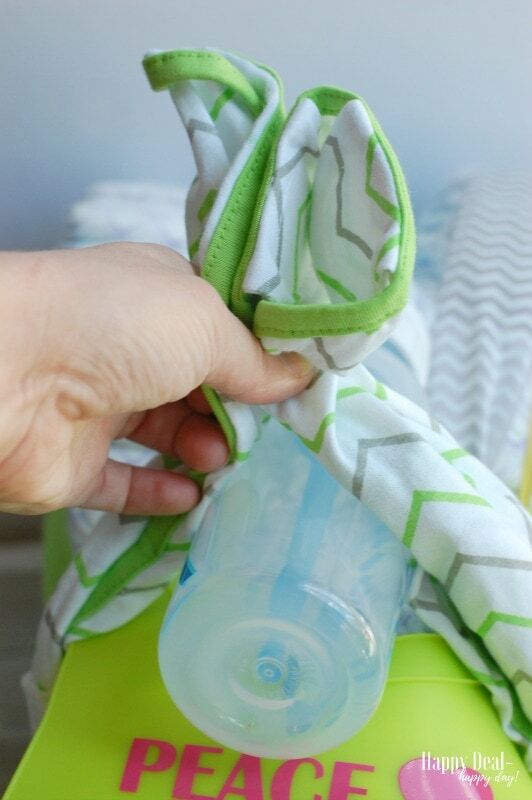 Use the second rolled blanket to hold the bottle in place. Secure it with another rubberband. Use the rest of the ribbon you have from your 9ft. 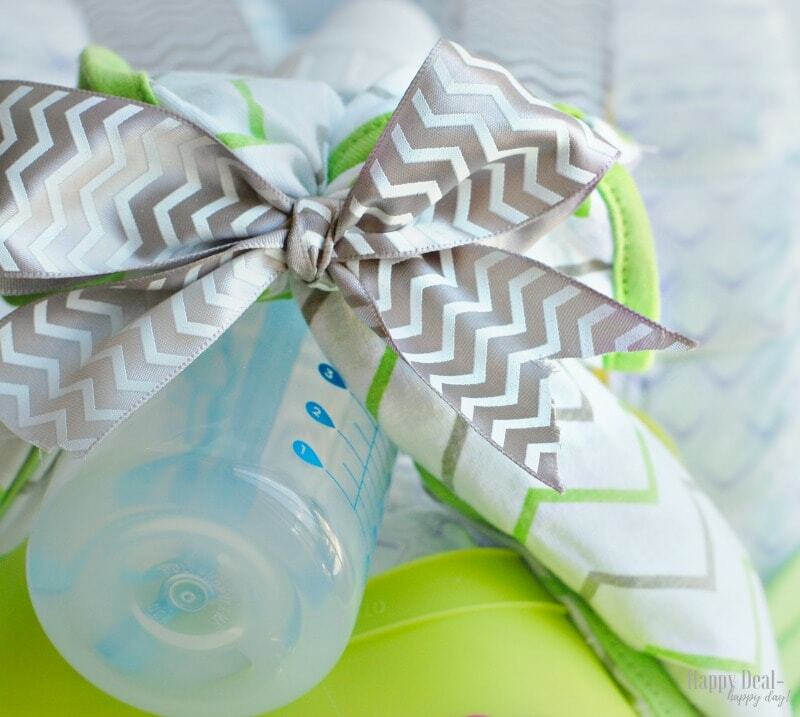 roll and make a cute bow to cover the rubberband. 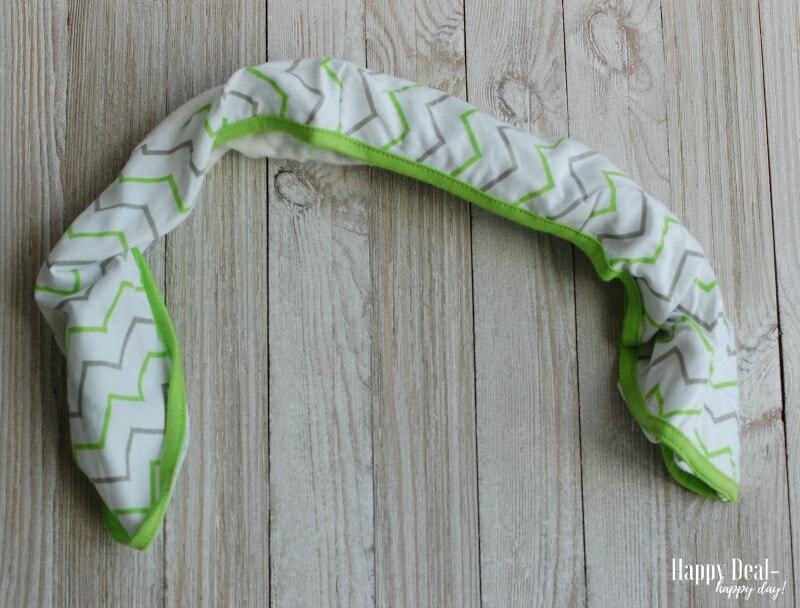 Now grab a pair of baby socks and place them over the ends of the blanket, making the tricycle handles. Isn’t it so cute the way it turned out??!! This tricycle bike needs a rider! 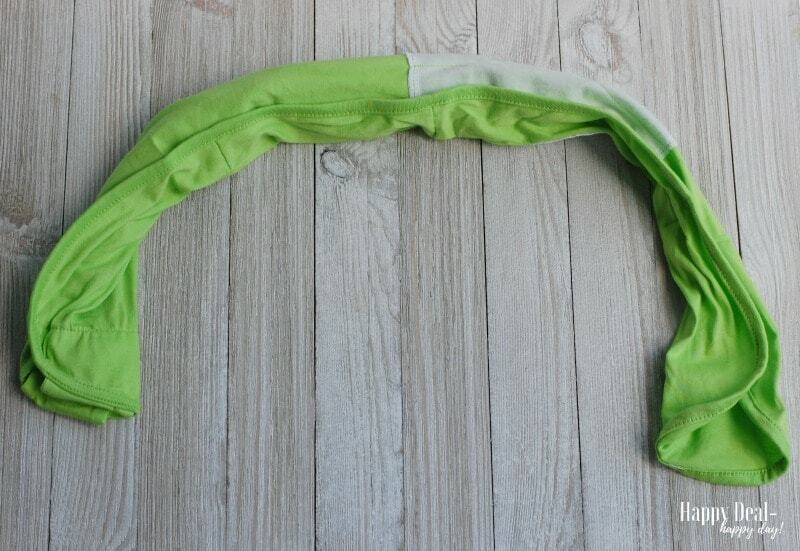 And we can get one and dress it up with more useful baby products!! I had a stuffed bunny, but I will recommend the Bed Buddy Warm Therapy Bear because you can warm this little guy up in the microwave for better snuggling! I then got a UV Skinz baby sun suit and dressed the bunny in that. I topped it off with one Chewbeads necklace. I would have loved to also add some soft sole Robeez to the feet of this bunny! I made this for my future niece or nephew (due August 2018!). My sister-in-law is driving us all nuts because she won’t find out the gender before he or she is born – so I tried my hardest to make this as gender neutral as possible. I absolutely love the way that it turned out! 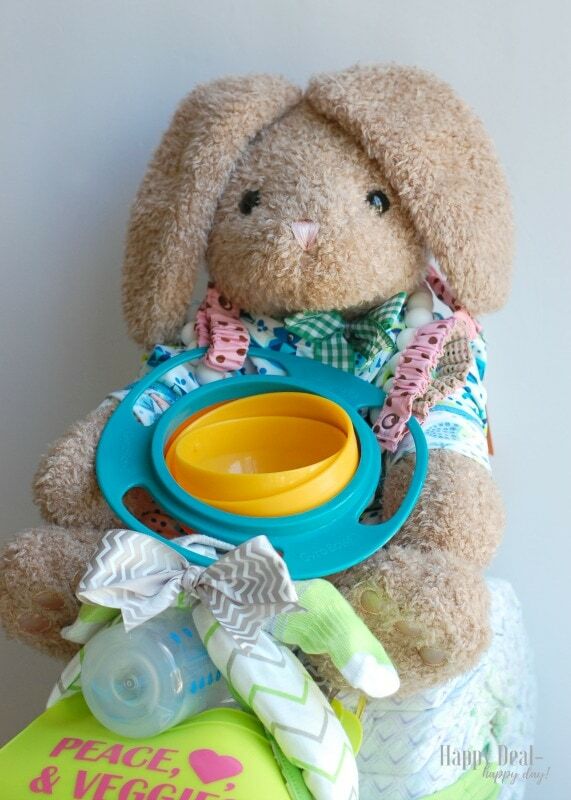 Everything here can totally be used for the baby (minus some rubber bands and ribbon.) 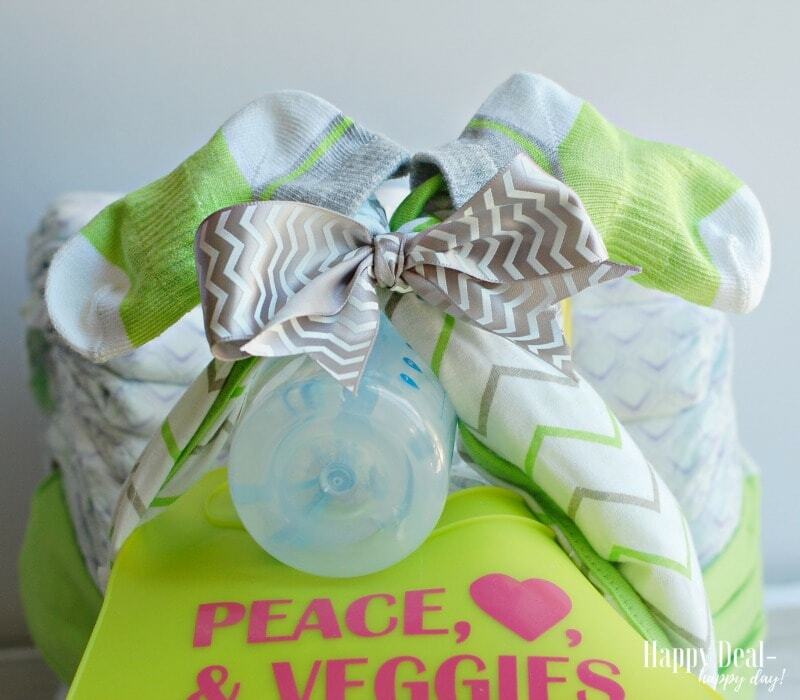 In fact, you could top this off by also giving a diaper bag or diaper backpack that will carry most of this baby gear! 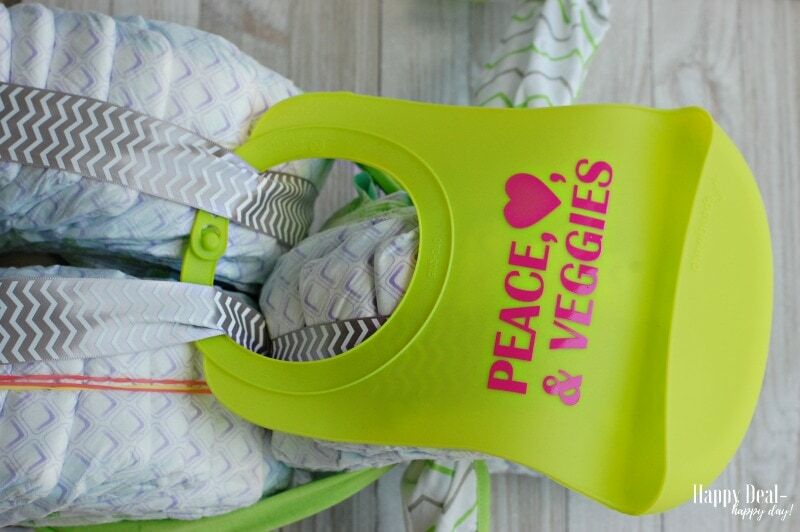 So if you purchase bags of diapers to make one of these, check out these reviews on the best backpack diaper bags. Another fun idea to do after the baby shower is to collect all of the cards and make a cute baby shower card collage out of them to hang in the babies room. That way the cards won’t just get recycled after the thank-you notes are written and a cute wall hanging can be made out of them instead!